with MARC staffer Ben Davis. 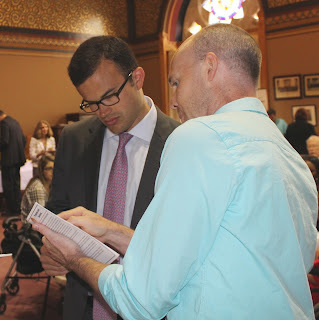 Co-Chair of the legislature’s Intellectual and Developmental Disabilities Caucus, Sen. Art Linares (R-33), stopped by the Arc of Connecticut’s Annual Legislative Reception. The event gives Arc representatives an opportunity to showcase their programs and the success stories of their clients. During the event, Sen. Linares met with Ben Davis and Larry Gray of Middletown Arc (MARC) who serve individuals in Middlesex County. MARC helps individuals with disabilities lead independent lives.